This is Hawk’s second book, following Atsugi Assassins published in 2007. A Day in the Sun tells of nuclear testing hazards at the Atomic Test Site in Nevada. This is Hawk’s second book, following Atsugi Assassins published in 2007. 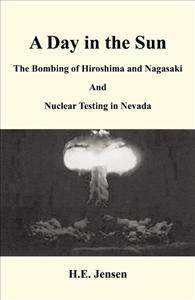 A Day in the Sun tells of nuclear testing hazards at the Atomic Test Site in Nevada. How he and other United States Marines were used as human guinea pigs testing flash, explosion, and radiation exposure. This book takes you through the bombing of Hiroshima, and Nagasaki. It covers the Rosenberg trail, nuclear proliferation, Agent Orange, and the chemical disaster in Bhopal, India. It tells of the radiation problem unfolding in Japan caused by the Tsunami, and explains the current time on the Doomsday Clock.